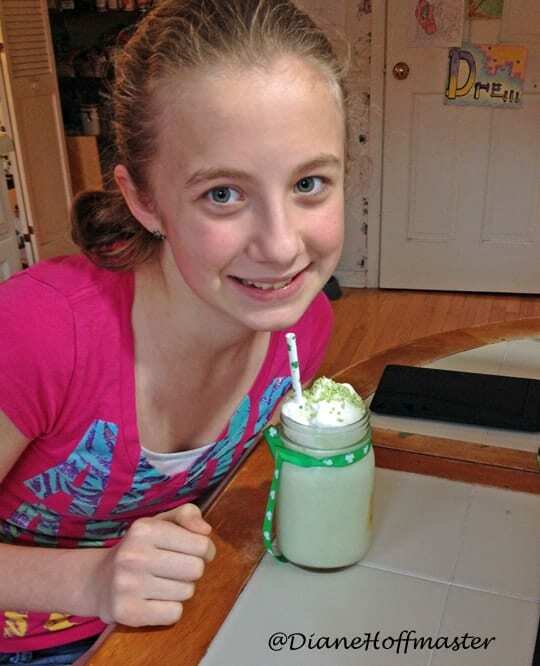 The other day, my daughter’s best friend showed up with a pretty green shamrock milkshake in honor of Saint Patrick’s Day. Of course, my daughter started begging me to get her one of these pretty things as well. I decided that I could easily recreate that green deliciousness with all natural ingredients. Depending on your local grocery store and it’s natural food selection, you may or may not be able to find the same ingredients I did. The shamrock milkshake recipe that I made contained: organic ice cream, organic milk, and organic peppermint extract. It was tinted green with kale juice. Yes, I really said kale juice! I used about a half a bag of fresh kale and put it through my Omega Juicer . I highly recommend you get one of these lovely appliances! Definitely made making this shamrock milkshake recipe lot easier. I have tried pureeing and boiling kale to dye things with and it just doesn’t work. See last year’s post on how to dye frosting green naturally. That was quite an experiment! I topped the shamrock milkshake recipe with homemade whipped cream made with organic heavy cream and even organic powdered sugar. I found naturally colored sprinkles from India Tree . Let me just say that my kids slurped this shamrock milkshake up and declared it absolutely delicious. You do NOT taste even one hint of kale in this treat, I promise! 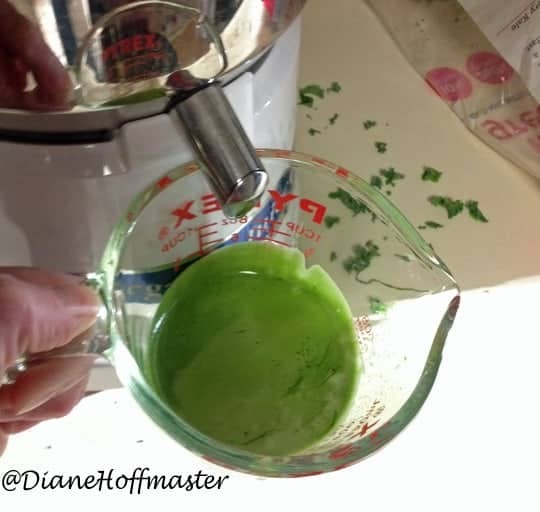 You only need a few tablespoons of juice to turn it a nice, bright green and if you do it without the kids around they wont even know the green didn’t come from a little bottle in your pantry. 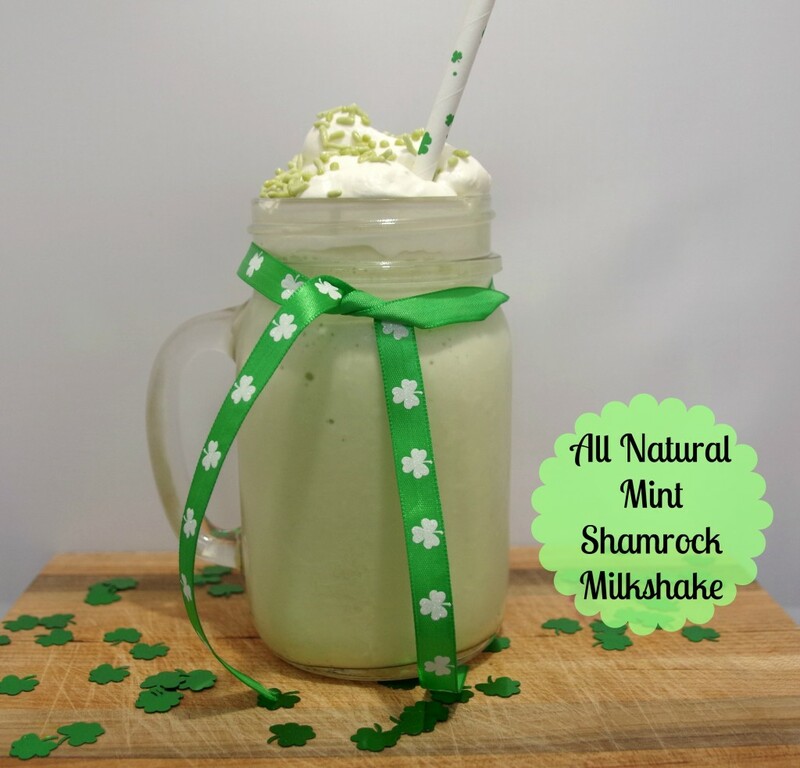 So, Happy Saint Patrick’s Day to all and I hope you enjoy this all natural shamrock milkshake recipe! Let me know if you try it! NOTE: My camera didn’t pick up the ‘green’ as much as I would have liked but trust me, it really is GREEN! Creamy, minty, and totally natural! Put ice cream, milk, peppermint extract and kale juice in blender. Blend until smooth. Add icecream or milk to adjust to desired thickness if needed. To make whipped cream: Place heavy whipping cream and powdered sugar in large bowl and beat on high until stiff peaks form. Pour milkshake into large glass, top with whipped cream and sprinkles. ENJOY! This looks beautiful! Does the kale juice not impart any of its flavour, or is it just masked by the sweet ice cream? Honestly, I tried it and got ZERO kale flavor. Between the sweet ice cream and the peppermint extract you will not even know it is kale juice! glad it caught your eye! I was feeling very excited that my kids actually admitted it was delicious...even if it WAS all natural!